in volunteering, please visit our How To Volunteer page. Get a free pet insurance quote from Healthy Paws and help a homeless pet today! 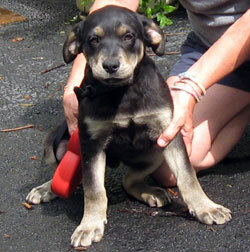 Alfie is a 13 week old black and tan Lab mix pup who is the largest and gentlest of his litter. He and his littermates are Lab mixes who were rescued in rural TN. They are fun-loving pups, very out-going and friendly. The litter consists of Ali, Alfie, Chyna, Cooper, Mia, Brandi, and Zeke. They are kid-friendly, but will jump up for attention, so possibly might knock a little one down. They are fine in the car, but are not leash trained yet. We require obedience training and puppy kindergarden and offer training at our shelter on Wed mornings for a discounted rate. Our process is that you apply online at http://www.saveadog.org/applytoadopt.asp. Please don't call as our volunteers are all busy taking care of the dogs. These pups are available to be seen on Fri/Sat/Sun. See home page for details. 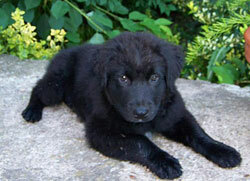 Ali and her littermates are Lab mixes who were rescued in rural TN. They are fun-loving pups, very out-going and friendly. The litter consists of Ali, Alfie, Chyna, Cooper, Mia, Brandi, and Zeke. They are kid-friendly, but will jump up for attention, so possibly might knock a little one down. They are fine in the car, but are not leash trained yet. Ali loves to play with toys and chew on sticks. We require obedience training and puppy kindergarden and offer training at our shelter on Wed mornings for a discounted rate. Our process is that you apply online at http://www.saveadog.org/applytoadopt.asp. Please don't call as our volunteers are all busy taking care of the dogs. These pups are available to be seen on Fri/Sat/Sun. See home page for details. Bart is a nine month old neutered male 35 lb. Heeler cross who is from Indiana. He walks well on leash, is good with other dogs, and good with kids (older preferred). He loves to play fetch and is a sweetheart.....he is always looking for a pet from anyone who comes into the yard. He is a VERY nice dog. We would love for you to meet this nice little dog, but please fill out an application on our web site first and we will be in touch. This is a litter of 5 of the sweetest puppies. There are 3 girls and 2 boys. They are very sweet dogs and love to play with each other. They are very young and will need someone who either works from home or is home full time. Please no phone calls, we are busy caring for these sweet puppies....Please fill out an application if you are interested in meeting one of this litter! Thanks so much! 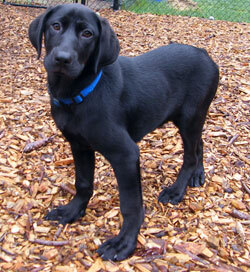 Brandy is a 13 week old Lab mix pup who is as sweet as can be. She is quiet, loves her toys, and loves the water. Look at her big webbed feet. Brandi is pictured (on the right) with her buddy, Chyna. She and her littermates are Lab mixes who were rescued in rural TN. They are fun-loving pups, very out-going and friendly. The litter consists of Ali, Alfie, Chyna, Cooper, Mia, Brandi, and Zeke. They are kid-friendly, but will jump up for attention, so possibly might knock a little one down. They are fine in the car, but are not leash trained yet. We require obedience training and puppy kindergarden and offer training at our shelter on Wed mornings for a discounted rate. Our process is that you apply online at http://www.saveadog.org/applytoadopt.asp. Please don't call as our volunteers are all busy taking care of the dogs. WHAT AN AMAZING DOG!! 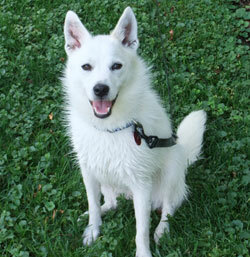 Calvin is a young male American Eskimo mix who was relinquished along with Hobbes and Lacey. They ended up in a rural shelter in TN on the list to be euthanized. Our rescue partner couldn't bear the thought and raced down to rescue them. He is an amazing dog. He is housetrained and very good in the house. He ignores cats and loves all the other dogs he has met. He is very friendly, loves attention and having someone to play with. He rides well in the car and is just adorable and small, he is about 20 lbs. He is available now. It is best to apply on our Web site, www.saveadog.org and select Apply to Adopt. Calvin will be at the meet and greet on Saturday. The details are on the homepage! 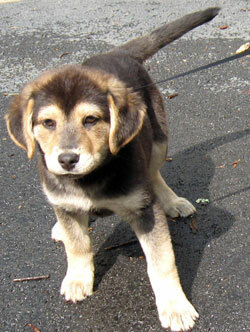 Chyna is a 13 week old Lab mix female pup who is available for adoption. She is pictured (left) with her sister, Brandi, on the right. They love to chew on sticks and chase balls. They share their toys nicely. Chyna and her littermates were rescued in rural TN. They are fun-loving pups, very out-going and friendly. The litter consists of Ali, Alfie, Chyna, Cooper, Mia, Brandi, and Zeke. They are kid-friendly, but will jump up for attention, so possibly might knock a little one down. They are fine in the car, but are not leash trained yet. We require obedience training and puppy kindergarden and offer training at our shelter on Wed mornings for a discounted rate. Our process is that you apply online at http://www.saveadog.org/applytoadopt.asp. Please don't call as our volunteers are all busy taking care of the dogs. See home page for details. 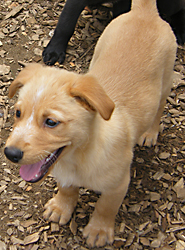 This is a litter of 5 Collie mixes. There are 3 girls and 2 boys. They are very sweet dogs and love to play with each other. They all eat from the same bowl and now we are teaching them to eat from separate bowls, but they share so well that they go from one bowl to the next as a group, so sweet. They are very young and will need someone who either works from home or is home full time. Please no phone calls, we are busy caring for these sweet puppies....Please fill out an application if you are interested in meeting one of this litter! Thanks so much! 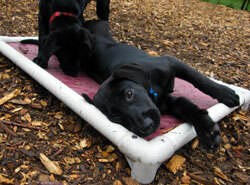 Cooper is a 13 week old male Lab pup who loves attention. He is desperate to bond with his new owner. He and his littermates are Lab mixes who were rescued in rural TN. They are fun-loving pups, very out-going and friendly. The litter consists of Ali, Alfie, Chyna, Cooper, Mia, Brandi, and Zeke. They are kid-friendly, but will jump up for attention, so possibly might knock a little one down. They are fine in the car, but are not leash trained yet. We require obedience training and puppy kindergarden and offer training at our shelter on Wed mornings for a discounted rate. Our process is that you apply online at http://www.saveadog.org/applytoadopt.asp. Please don't call as our volunteers are all busy taking care of the dogs. These pups are available to be seen on Fri/Sat/Sun. See home page for details. 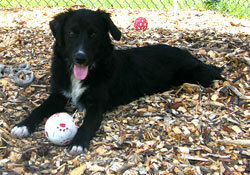 Fanny is a beautiful two to three year old spayed female Border Collie mix who is amazingly calm. If you like the looks of a Border Collie without the hyper energy, this is your dog. She's so sweet and will just settle down with a bone, not making a sound. Her story is that she ended up in a shelter in rural Indiana. She walks well on leash and is great with dogs and kids. 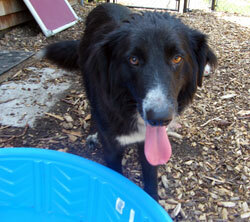 She is a sweet heart of a dog and very mellow for a Border Collie. We recommend older kids because she's a herding breed. Her foster mom reports Fanny is affectionate. She likes to be petted and when you stop, she puts her nose into your hand so you will continue petting her. She does not jump up at all, no counter surfing, no chewing. She is crate trained, house trained and is very quiet in the house, is not at all a barker. She likes to play with other dogs and is very curious about sounds and smells. She collects toys and puts them on her bed and walks well on a leash. A really nice dog. Our process is that you fill out an application on our Web site under Apply to Adopt and then we'll have it ready when you come to meet her. 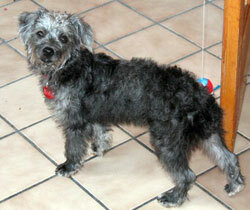 Gem is a 7 month old female Poodle/Scnauzer mix "Schnoodle" who was a pet store dog. She was not socialized and spent life in a crate, so when she first arrived, she was terrified and unsocialized. Our volunteers have been working with her for several weeks and she has made amazing progress. She still won't let a stranger pet or pick her up, but will climb in the lap of the volunteers she knows. She's young and will be a different dog with someone willing to work with her. Already she comes up and will put her paws on you, and will eat out of your hand. She now will let us pet her and pick her up!. She loves other dogs and will play with the other dogs at the shelter. She is crate trained and will go on pee pads, and is improving with house training. She loves chicken and will come and gently take it out of your hand. Please be someone experienced with small or shy dogs and be someone who can read her body language. Please fill out an application if you are the right match for her. If you are a rescue group who has a foster home, please contact us. Right now we're looking for someone who has a gentle touch or experience with small, timid dogs. Adult home preferred. 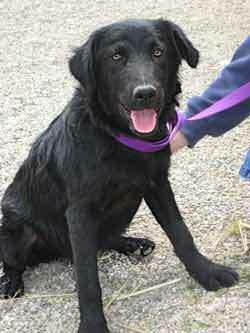 Hershey is a 40 lb male Retriever mix who was rescued along with his sister, Mya, in rural Indiana. He is a sweet boy who would make a wonderful addition to your family. He is available as of June 7th. He is coming up on a transport called Canine Express. Please fill out an application so that we may begin the process. 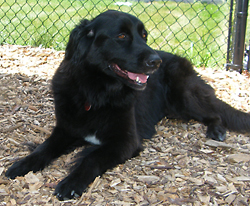 Jenny is a 3 year old spayed female Retriever who is gorgeous. She looks like a golden ret. but black, so probably a Flat-coated Retriever of some sort. She is a very sweet dog and was raised with kids. Her people tied her out and she was getting zero exercise or attention. Retrievers are born for both, so please be someone who is young, active and wants a dog to run and play with. She is not a dog for a non active person or family. She is great in the car and good indoors. Typical Retriever who is as strong as she is lovable. Love her, please. She needs a great home! Logan is a beautiful male pup who is a gentle and sweet and not mouthy at all. He's going to be an unbelievable dog for someone. Come and fall in LOVE! History: he came up from Indiana. He is through his second set of puppy boosters and is part of a litter of 4 males. They are big puppies and love to play, play, play. We're guessing there might be some Newfie in there. They were in a big fenced in play area with their toys and swimming pool. They LOVE the water and are so much fun to watch, they do very well with larger dogs but they like to give the cats a good chase to the barn. Because of their size, older children are recommended. Max is the cutest dog! Someone just has to come and fall in love with him! He's a 2 year old, neutered male Rat Terrier. He is the SMARTEST dog in the whole world and we'll tell you why in a minute. 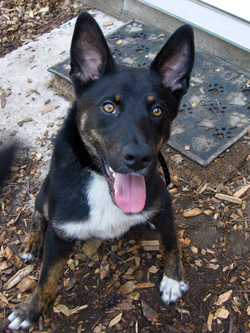 History: We think he's a mix as he's slightly larger, weighing around 20#. He originally lost his home because his owner had cancer. He was raised with teens, so teens and up would be fine. He has quite a personality and he is VERY smart. He was the star of our obedience class this week. He figured out how to get treats in about 30 seconds and was quite a character about it. He likes to chase bugs and he catches them too. Nothing gets past his acute sense of hearing and smell. If you ask him to go find his friend, Maple, he will go round her up in the yard and bring her in. Such a smart dog. He and Maple BFFs so we would like to find them a home together BUT we think he would be fine as an only dog too or with another dog as he's so outgoing and playful. We don't want Maple to hold him back if there's a chance he couldget a great home. He and his pals play all day long, leaping from sofa to sofa and skidding across the hard wood floors. Then they flop down in a pile and go to sleep. Up until recently, they lived with a large greyhound. A fenced in yard is a must because Maple would escape an unfenced yard. Also she needs to be able to go outside and come in on her own. Our process is that you fill out the application first, no obligation. He is willing to do whatever was asked of him with a BIG smile on his face! It was a joy to watch...he will be a fun dog! Oh and he LOVES to play catch! Details are on the homepage! 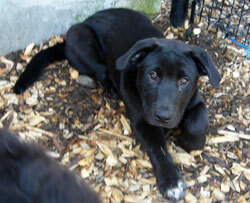 Mia is a 13 week old female Lab mix pup who is the smallest of the litter. She is not a jumper, but will quietly explore her surrondings. She's a curious pup. 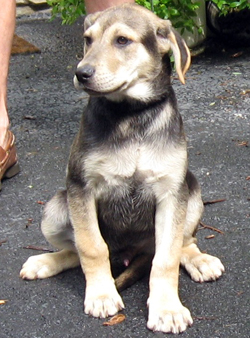 Mia and her littermates are Lab mixes who were rescued in rural TN. They are fun-loving pups, very out-going and friendly. The litter consists of Ali, Alfie, Chyna, Cooper, Mia, Brandi, and Zeke. They are kid-friendly, but will jump up for attention, so possibly might knock a little one down. They are fine in the car, but are not leash trained yet. We require obedience training and puppy kindergarden and offer training at our shelter on Wed mornings for a discounted rate. Our process is that you apply online at http://www.saveadog.org/applytoadopt.asp. Please don't call as our volunteers are all busy taking care of the dogs. These pups are available to be seen on Fri/Sat/Sun. See home page for details. 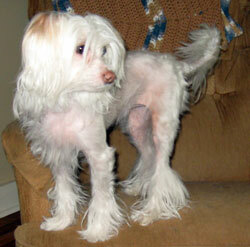 Murphy is a white, 2-3 yr old powderpuff Chinese Crested. She is spayed, friendly with everyone, good with all dogs, cute as a button and desperate for a person who will be her everything! She is housebroken, crate trained, great in the car, leash trained and loves to sleep in the bed with someone. She made herself right at home as soon as she got to her foster home. She likes to sit with you while you watch TV. She has a full coat when not clipped. Please apply online as she is in foster care and will need to be brought to the shelter for you to meet her, once we have reviewed your application and set up a time for you to meet her. As she is a white dog and a delicate breed, a holistically-minded home is preferable as these dogs develop allergies if ultra care is not taken. 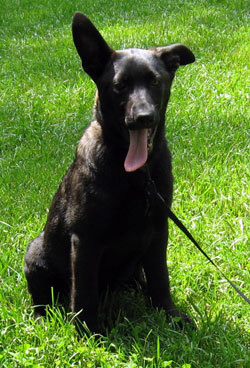 Mya is a sweet 8 month old female Retriever/Collie mix who loves playing with other dogs. Her litter mate is Hershey. She is a medium size dog and now weighs 32 pounds. She loves to get some love from people. She is a dear dog with a playful personality. She would love to go for hikes or hang out at home. She is a long-haired dog who is just so lovable and joyful. She has a rough start in life, living in a place where nobody cared for her and yet you would never know it as she is so friendly and just loves people. She will be a great dog for any family! Please fill out an application so that we may begin the process. Nigel is a wonderful little dog who is good with dogs, cats, and people. So far he's been great with kids, but we'll test him more. He has the appearance of a Wire-haired Terrier with the fuzzy whiskers and black saddle, but we could be wrong. He is small (15#), good with cats, people and other dogs. He is super sweet and cute as can be. He likes to give kisses! He showed up at a veterinarian's office and didn't seem to have a home as he never left so they took him in. He's a cute little guy who rides well in the car, walks well on leash, and is pretty calm overall. He would be great for someone who wants a nice dog in a small package. 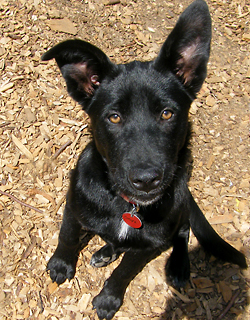 Onyx is a 3.5 month old Lab mix who needs a home. She was given up when her owners moved to an apartment. She is a wonderful pup with much to offer her adopter. She is playful, but not hyper. She is good with cats too! She knows how to sit, shake and stay and is leash trained....not bad for a 3.5 mo old pup. (And she's pretty much house trained, but no pup is 100%.) She is very good with strangers and other dogs. She loves to play with other pups and adult dogs too. She is still getting used to the car but if someone is petting and playing with her...then she forgets about the car. Please fill out an application and we will invite you to come meet her. 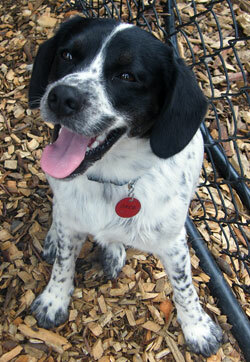 Oreo is a one year old neutered male Spaniel mix who is looking for a new home. He is from Indiana and arrives on June 4th. Please fill out an application on our web site so that we may be in touch once he arrives. 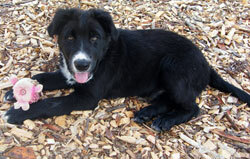 Rowen is a beautiful male pup who came from Indiana. He is the smallest of the fluffy pups. He is through his second set of puppy boosters and is part of a litter of 4 males. They are big pups so we're guessing maybe some Newfie in the fluffy ones. They love to play, play, play. They are in the big fenced in play area with their toys and swimming pool. They LOVE the water and already know how to swim. They are so much fun to watch, they do very well with larger dogs but they like to give the cats a good chase to the barn. Because of their size, older children are recommended. Ruth is a friendly, house trained 2 year old female hound mix seeking a new home. 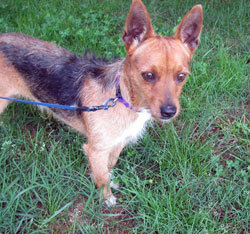 Ruth is playful, fun, LOVES to swim, and the outdoors! She loves her walks but will also settle nicely indoors for some snuggling. Ruth has responded well to training and is eager to please! She already knows, "come, sit, stay, paw, down, off, and heel" and is very motivated by her "cookies!" She is currently living in the city with no yard and she's too active for her current owner, so needs a more suburban setting (we recommend a fenced in yard for all hound-types and adolescent dogs her size). 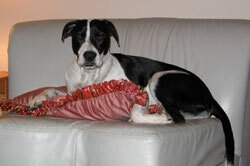 Ruth is well-socialized and loves people, including children. She likes to play with other dogs but can get a little too excited if too many dogs are playing at once. Ruth thrives with one on one playtime or in smaller settings where she doesn't get overstimulated and can enjoy her play! She also loves to play ball with her people! Ruth is living in an apartment, and, while happy, would likely be even happier with a yard to call her own and a family to join her for long walks, hikes, swimming, and games of fetch, as well as cuddling on the couch! 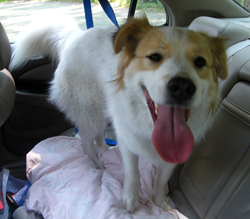 She is a wonderful and FUN dog and companion and deserves the very best that a family has to offer her. She is healthy, house trained, and comes with all her vet records. 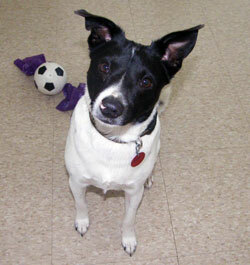 Ruth is a loving, funny, and happy-go-lucky dog, and would be a great addition to an active family! Sam is a beautiful male pup who is as lovable as they come. He is calm, quiet, and gentle. He came to us from a foster home in Indiana. He is through his second set of puppy boosters and is part of a litter of 4 males. They are big pups so we're guessing there may be some Newfie in the fluffy ones. They love to play, play, play. They were in a big fenced in play area with their toys and swimming pool. They LOVE the water and already know how to swim. They are so much fun to watch, they do very well with larger dogs but they like to give the cats a good chase to the barn. Because of their size, older children are recommended. Available now. 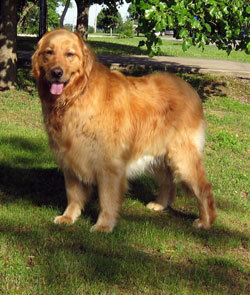 Sophie is a 4.5 year old 75# Golden Retriever who was given away by her owner who didn't have time for her. She is good with cats and kittens, good with other dogs, but will occasionally get toy possessive so needs to be watched. We will not place her with young children just to ensure she doesn't lose her home again, in case she ends up being toy possessive with kids. Save A Dog requires obedience training for all dogs so the right person willing to work with her, someone with experience, won't have any issues. She likes to sit beside you or lie at your feet. Typical golden ret…..Velcro dog! We have clicker training (positive reinforcement) training here on Wednesday mornings that you can sign up for. She is housebroken and crate trained too. She is not super hyper, but she is a Golden so expect her to dive into a pond or lake and then come in the house dirty. :-) Apply online before coming to meet her. Thanks! 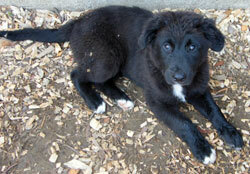 Summer is a 15 week old Shepherd/Elkhound puppy who is gentle and very affectionate. They LOVE to play in the water! Camille, Dora, and Summer are all littermates who were rescued from TN. Pups like this are euthanized down south on a daily basis. They are fun-loving pups, very out-going and friendly. They are kid-friendly, but will sometimes jump up for attention, so possibly might knock a little one down. They are good on leash and fine in the car. We require obedience training and puppy kindergarden and offer training at our shelter on Wed mornings for a discounted rate. Our process is that you apply online at http://www.saveadog.org/applytoadopt.asp. Please don't call as our volunteers are all busy taking care of the dogs. These pups are available to be seen at our shelter. See home page for details. Tanner is a beautiful 15 week old male pup who is the gentlest of his littermates, although they are all gentle and not mouthy at all. They had been in a foster home in Indiana. 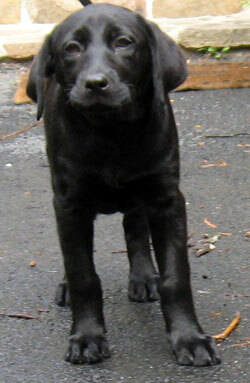 He is the short-haired more Labby looking of his litter and seems to be the largest pup. Very sweet, though. He is through his second set of puppy boosters and is part of a litter of 4 males. They love to play, play, play. They were in a big fenced in play area with their toys and swimming pool. They LOVE the water and already know how to swim. They are so much fun to watch, they do very well with larger dogs but they like to give the cats a good chase to the barn. Because of their size, older children are recommended. Zeke is a 13 week old male Lab pup. He's the most affectionate pup who wants to be with you 24/7. He has the longest fur of this litter. 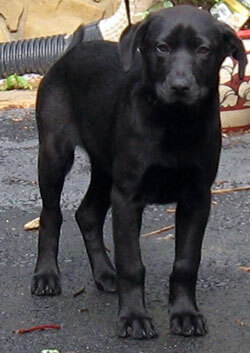 Zeke and his littermates are Lab mixes who were rescued in rural TN. They are fun-loving pups, very out-going and friendly. The litter consists of Ali, Alfie, Chyna, Cooper, Mia, Brandi, and Zeke. They are kid-friendly, but will jump up for attention, so possibly might knock a little one down. They are fine in the car, but are not leash trained yet. We require obedience training and puppy kindergarten and offer training at our shelter on Wed mornings for a discounted rate. Our process is that you apply online at http://www.saveadog.org/applytoadopt.asp. Please don't call as our volunteers are all busy taking care of the dogs. Available this Fri, Sat and Sun! Volunteers | Shopping | Holistic Dog | Info For Dog Owners | Dog Friendly | Pet Humor | Poems/Stories | Rescues | Shelters | Giving Up A Dog? Copyright © 1999-2019 Save A Dog Inc. All Rights Reserved.